Photo courtesy of Mark Simpson. Jamie Murphy (left) and Renee Smith. 8 p.m., Fri., Nov. 15, and 2 and 8 p.m. Sat., Nov. 16. Whether it is laughter, birds chirping or the rush of a car as it passes by, sound is integral to life. So what happens when sound is removed from our lives? That question inspired the Murphy/Smith Dance Collective's new work, See What I Hear, which the company will perform Nov. 15 and 16 at the Kelly-Strayhorn Theater. 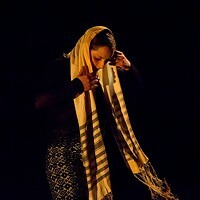 The 60-minute multimedia work, choreographed by company directors Jamie Murphy and Renee Smith, came about through personal experiences the two had involving family members with hearing loss. For Smith it was her grandfather, whose hearing loss stemmed from his service in World War II. "I think everybody in one way or another has had this be a part their lives," says Smith. "His feelings of isolation, and our family's efforts to make him a part of our conversations, were part of the inspiration behind this work." Murphy and Smith also decided to explore how sound creates environments, and how it affects communication both verbally and non-verbally. 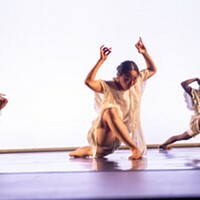 See What I Hear represents the maturation of those ideas, first seen in a shorter dance work the pair did for the Kelly-Strayhorn's 2012 newMoves Contemporary Dance Festival, and further developed during an artist residency and work-in-progress showing at the theater this past July. Murphy and Smith call See What I Hear the most involved production their 2-year-old modern-dance company has mounted to date. "We tried to make the work more theatrical and light-hearted, as opposed to concentrating solely on the challenges of hearing loss," says Murphy. See What I Hear is set to an original score of music and sound by percussionist/composer Gordon Nunn, along with sounds created by the work's seven dancers. The piece will move through sections that are literal — such as one in which sounds like raindrops, chewing and snoring are used to trigger specific memories of danger — and sections that are more abstract. The latter includes a passage involving the concept of sound-color synesthesia, in which the dancers will try to physically interpret colors that are identified (in some studies) with certain musical pitches or keys.